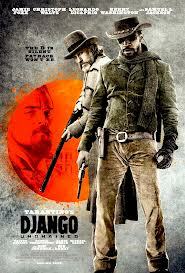 Django (Jamie Foxx) is a slave who’s been separated from his wife Bromhilda (Kerry Washington) for more than a year yet is given the chance of rescuing her and seeking vengeance at the hands of Dr King Schultz (Christoph Waltz) who frees Django from slavery in hopes that he can identify the men who captured him and Bromhilda as there’s a bounty on their heads. Dead or alive. Django and Schultz almost instantly become a team with Django referred to as deputy bounty hunter and their greatest mission yet; rescue Django’s wife, but the great obstacle? Buy her from Calvin Candie (Leornardo Dicaprio), a Mississippi plantation owner who despite his flamboyant mannerisms may be one of the foulest creatures to walk the earth. Candie’s curiosity gets Django and Schultz in the front door, but it’s carnage and ruthlessness that’ll get them out. Candie’s ace in the hole is Stephen (Samuel L Jackson), a master slave whose dedication to Calvin and dislike for Django only increases the tension and chances of bloodshed. Can they save Bromhilda? Can Calvin Candie be stopped despite his advantages? Will Django finally be reunited with his wife and thus truly find peace in an environment and era that judges him purely based on the colour of his skin? We hear of how great Quentin Tarantino is and his name is renowned in all the land, but why? His use of violence to tell a story and invite humour in the mix? His characters? The use of exploitation and references to movies from yesteryear integrated with a complex story making a fun yet monumental film experience? If you said all of the above, then yes, that’s why. He’s observed, deconstructed, reconstructed and almost redefined the usual conventions of cinema yet never forgetting the importance of entertainment. However, the fact remains, his true downfall is his attempts at familiar trademarks which include continuous cameo’s from the man himself, and herein lies the problem with Django. Django Unchained is an almost perfect entertainment picture, he’s finally perfected the balance between grounded and intricate storytelling infused with complexity and trashy exploitation which embraces excess and audience satisfaction. Inglourious Basterds is in my opinion a masterpiece because it tipped in the favour of complexity, Django on the other hand, comes close. Even with the balance it reaches, the fact remains that the film’s final half an hour proves to be its clunkiest and diverts away from that grounded storytelling mentioned earlier. The balance remains but it still collapses in itself. One scene in particular where Tarantino can’t help but add one of his signature trademarks ruins a perfectly good scene which is imperative to the story and comes across as embarrassing. It’s the one true flaw of the film and can only be considered embarrassing because of what’s achieved before it. Even with this scene intact, Django Unchained is still a film to behold. Foxx’s performance is the true definition of stoic yet glimpses of desperation, fear and compassion really make Django a character with dimensions as opposed to an empty vessel that happens to look cool. Leornardo Dicaprio gives one of his best performances which goes beyond just evidently having fun in a role so different to the ones he usually plays. He’s charming yet sadistic and vile, and from the minute we see him we’re convinced. Kerry Washington is fantastic as is Samuel L Jackson, despite their differences in character, there’s conviction in their performances. Don Johnson in a minor role is also brilliant as a character named Big Daddy (it’s so appropriate, you’ll see) but best of all? Why yes, it is Christoph Waltz, playing a much nicer character than Hans Landa from Inglourious Basterds. This man was born to deliver dialogue and helm characters with conflicts greater than the rest. He is charming, menacing and all out perfect, mark my words you will love this man. Django Unchained is a funny, horrific but ultimately enriching film that portrays slavery as the holocaust it was (Roots was child’s play compared to this) yet rewards its audience with all the elements that make a great film with Tarantino once again giving us another reason to love cinema in the way it entertains yet challenges us more than words could describe.